I am pretty excited to be painting again. I have a commission piece that I started this week. 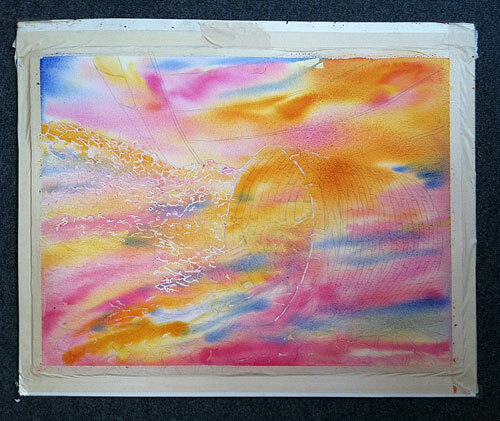 This is a poured watercolor and this is the second application of paint. It doesn’t look like much now, but it will look more like recognizable objects soon. With poured paintings the key is to get the correct values into the correct shapes. I use masking fluid to save the light areas. 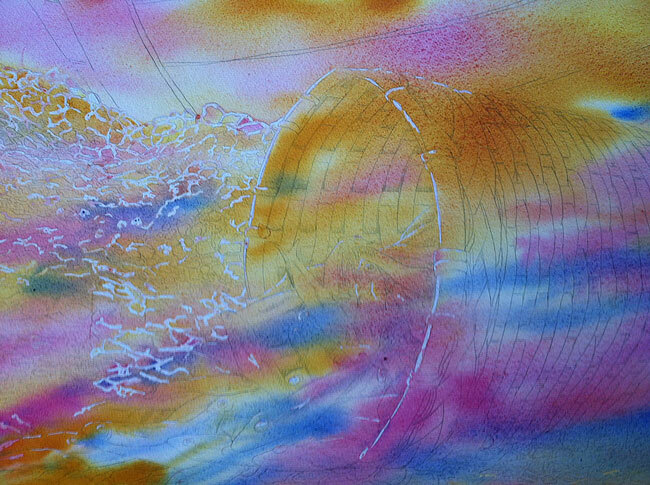 I apply wet washes, like here, then allow it to dry thoroughly. Then I use masking fluid to save more values and continue on with darker washes. I may apply up to ten layers of color to create all of the values I desire. Here is a close-up view. The drawing is a little more visible in this photo. You can also see some of the masked areas that are resisting the wet pigment. Using a full size sheet of Arhces 300 pound cold press paper, I used Quinacridone Gold, Quinacridone Magenta, and Ultramarine Blue for this stage. I have a few lessons on how to create “poured” paintings on my lessons tab above. Enjoy! So glad to hear you are painting. I’ll watch for the next installment.